Japan’s public television broadcaster, NHK, is working on technology that will allow people to watch TV with their fingers. 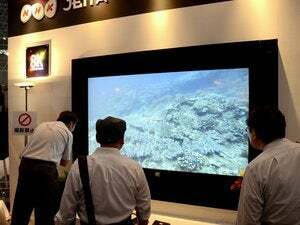 NHK is developing a system that maps objects shown on the TV screen in 3D space. “Viewers” place their index finger in a device connected to several actuators that provide haptic feedback, allowing surfaces, bumps and corners to be explored through touch. The broadcaster demonstrated the technology as part of an open house at its research lab in Tokyo. NHK is also working on a new platform for interactive TV, where viewers use tablets and smartphones to make comments about live shows, which are then shared and appear on ‘the TVs of their social contacts. One demonstration allowed users to tag specific locations on screen with comments, while another let viewers upload hand drawn pictures as part of a children’s show. The company said it hopes to launch some of the services in Japan this year. 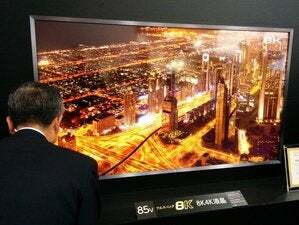 NHK is also forging ahead with its “Super Hi-Vision,” or 8k, format, which measures 7,680 by 4,320 pixels. TV manufactures are beginning to produce sets that can show 4k and 8k, named after their horizontal resolution, but content is still scarce. NHK, which aims to launch a broadcast service in Japan by 2020, is working on developing cameras that can shoot in the format and are easy to use. Early versions were bulky devices the size of small cannons, but the company’s latest creation is on par with standard TV cameras, although it has a slightly lower resolution than true 8k. The massive data requirements are also a challenge, as cameras record at nearly 72 Gbps. To support its latest camera, NHK has designed a small computer with 1.5TB of flash storage, although that can only hold 50 minutes of footage. Updated at 10:17 a.m. PT with a video report from IDG News Service.